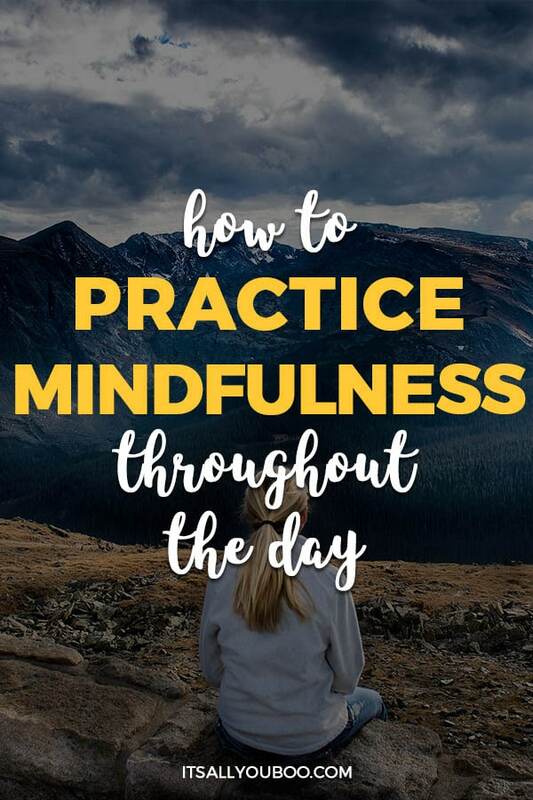 How can I practice mindfulness throughout the day? What are the best ways to be mindful in everyday life? Another day has sped by. Looking back, you wonder where it went and how you spent your time. Maybe you look back and realize you spent too much time scrolling through social media or you unintentionally made food choices that you actually wanted to avoid. Then you ask yourself: How did that happen?! If that sounds familiar, don’t worry. We’ve all been there… way too often. But what if I told you it doesn’t have to be like that? What if there was a simple way to become more present and attentive to your surroundings, activities, and thoughts? And what if, on top of all that, you could reduce stress and anxiety with a practice that will fit into even the busiest schedule? And one more awesome thing: you can get great results for investing just a little bit of time. Wondering what this amazing practice is all about and how you can learn to take back control of your day? Then wonder no more. I’m talking about mindfulness and mindfulness meditation. Since it’s become quite the buzzword recently, you’ve probably heard of it before. But what is mindfulness really? And what is mindfulness meditation? Why should you even bother with it? How can it help you live more deliberately? And of course, how to practice mindfulness in busy everyday life? THIS POST INCLUDES AFFILIATE LINKS. CLICK HERE FOR THE FULL DISCLOSURE STATEMENT, THANKS FOR YOUR SUPPORT! To put it very simply, mindfulness is a practice during which you consciously observe what is going on around you, in your body and your mind. This definition explains the basics of how to practice mindfulness too. But more on that later. Did you notice how they call mindfulness a ‘basic human ability’? That means mindfulness is something we are all capable of by design. Then why do so many of us still rush through our days mindlessly, you’re asking? Because of two simple reasons: firstly, while the idea behind mindfulness is simple, it’s not always easy to live it. Secondly, we haven’t honed the skill. In that regard, mindfulness is like any other ability. To get better at it, we need to practice. A great way to do that is through mindfulness meditation. It’s a great way to cultivate awareness of your mind and body and ground yourself for the rest of the day. If you’re already doing all the things, you’re probably wondering why you should add yet another one to your every growing list. And I totally get it. After dedicating time to raising a family, building your business and trying to stick to workout goals, there aren’t many hours left in the day. Think of it though. How frustrating and draining is it to rush through your days mindlessly and stressed? Mindfulness is a wonderful way to tackle this. Still not convinced to try it? Here are a few more reasons to at least give it a try. It’s easy to get started: To start your own mindfulness practice, the only thing you need to invest in a little bit of time. You don’t need any books, courses or equipment, only yourself and a quiet spot you can sit undisturbed for a few minutes. It’s more than a practice: Of course, you can do your five minutes of mindfulness meditation and leave it at that. But real mindfulness is so much more. After a while of practicing, it will become part of your lifestyle rather than something you do for just a few minutes a day. You’ll see that when the positive side effects show up during work, in your relationships and other areas of life you might not have thought of at first. 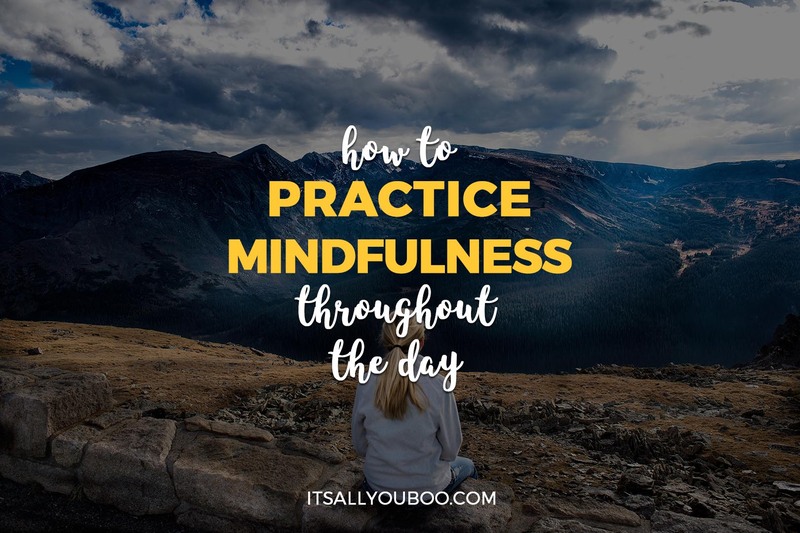 Now that we know a bit more about why it’s such an awesome thing to cultivate, let’s look at how to practice mindfulness! Since there are so many different ways to develop it, I’ve put together a list of examples of mindfulness practices that can help you calm your mind and become centered and present. A quick note before you start: when you try to clear your mind or concentrate on your breath, your mind will wander. Some days it might be easier to focus, on other days your thoughts will race. That’s normal and it’s ok. 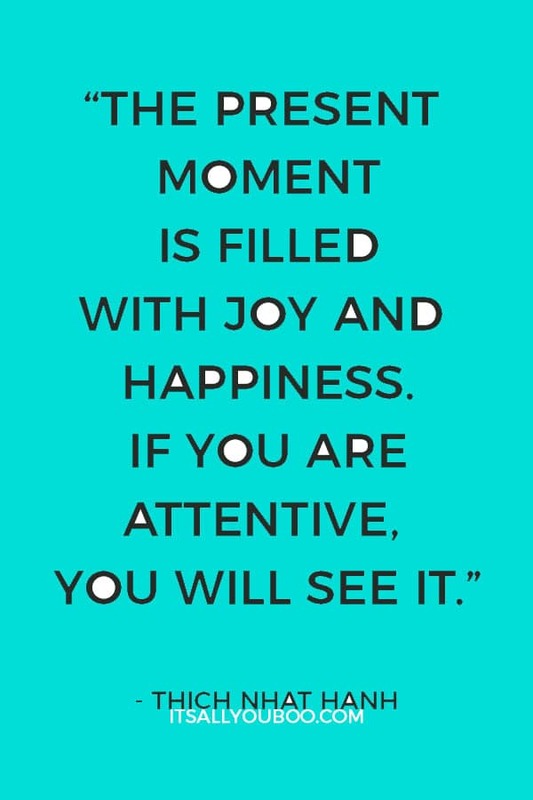 When you notice that happening, gently brings your mind back and let go of your thoughts without judgment. Over time this will get easier. Until then, just go with it and enjoy the journey. A great way to get started with mindfulness is to use guided meditations. They’re amazing because all you need to do is press ‘play’ and focus on the speaker’s voice. He or she will ask you to focus on your surroundings, your body, your breath or a particular thought. Depending on the type of guided meditation you’ve chosen, you might stay with the breath or focus on areas of life and work. Some of the best-guided meditations I’ve come across are on apps like Headspace, the Smiling Mind and Stop, Breathe & Think. They all have free and paid options, so you can give them a try before subscribing. But honestly, the free content on all of them is so good, you don’t really need to upgrade. Maybe sitting still isn’t for you? No worries, you can practice mindfulness while walking too! There are plenty of guided walking meditations out there, or you can do this on your own. Start by standing upright and comfortably, with a slight bend in the knees. Breathe deeply into your belly and take in your surroundings. Then, start walking at a pace which is a bit slower than usual and keep a steady gaze ahead of you. Try to concentrate on every breath that comes and goes all while maintaining a soft gaze ahead. After anywhere from five to twenty minutes (or longer if you like), come back to stillness. Take a few more deep breaths to end your practice. A big part of mindfulness is paying attention to your body. 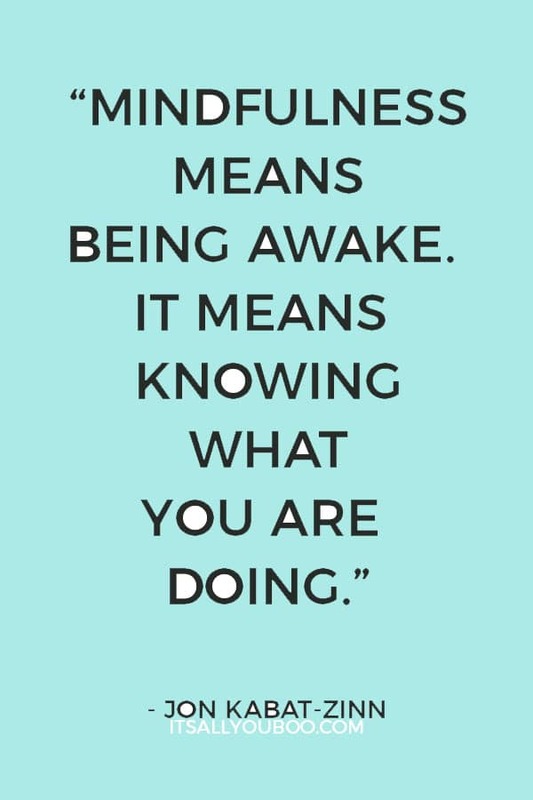 That’s why, if you don’t have the time for a longer meditation or just want a short break from your day, a body scan can help you come back to a place of awareness and calm. During this time, you can become aware of the different parts of your body all while giving your busy mind a chance to rest. Once you’ve gotten to the tips of your toes, take a few more deep breaths before coming back. Another time to practice mindfulness is during meals. Many of us rush through a hectic lunch, barely knowing what we are inhaling because we’re already thinking of our next meeting or all the other tasks left to complete. Instead of treating meals as a quick pit-stop, why not take a few extra minutes to enjoy your food all while giving your brain a break too? Let’s look at how to practice mindfulness while eating. To start, take a few moments to look at your food. Then focus on the smell. Does it smell sweet or spicy? When you have your first bite, try to notice as much as possible about your food. How does the texture feel? What flavors can you detect? Is it warm or cold? How is it all changing as you slowly chew? What do you feel after swallowing? Repeat these steps as often as you like. This approach will help you eat more deliberately and slowly. That gives you a chance to fully enjoy your meal and stop when you’re full. It also helps you make better food choices since when you eat slowly and deliberately, you’ll be less likely to eat something you don’t really like or are trying to avoid. Since the idea here is to make it as quick and simple as possible, all you need to do is sit upright in your chair, close your eyes and relax. Now, take ten slow breaths deep into your belly. Try to feel how your breath enters your nose, expands your lungs and finally your abdomen. Do the same as your exhale. This deep focus on your breath is wonderfully calming and you can find time for it even during the most stressful days. Did that just sound like a lot of things to do at once? Don’t worry. While all the mindfulness exercises I outlined above are effective and worth a try, instead of doing them all, start with one and see how it works for you. Maybe try it at different times during your day, i.e. in the morning, after lunch, before going to bed or whenever you feel like you need to take a quick breather. By slowly adding these little moments of deliberate mindfulness to your life, you will start making this practice familiar. That way your brain will get used to these moments of slowing down and clarity. That way, mindfulness will become a habit which shapes your behavior and helps you go through your days more consciously and deliberately. Since mindfulness benefits your physical and mental health as well as your relationships and productivity, you’ll start seeing positive impacts in many areas of your life. That can include reduced stress, improved communication and you feeling calmer overall. Ready to be more mindful? To clear your mind and be more present? 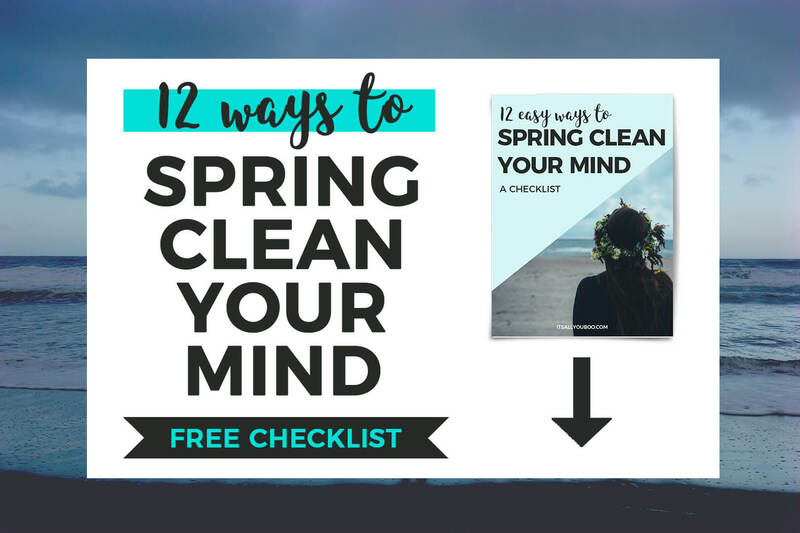 Get the Spring Clean Your Mind Checklist, with 12 strategies for clearing mental clutter and welcoming positivity and happiness. Don’t believe me that this simple practice can make such a huge difference? Good! Then try it for yourself right now and see the positive impact first hand. Simply pick one of the practices outlined above and do it right now. After all, the best time to start moving towards a calmer, clearer state of being is right now! What a beautiful piece of writing. Thanks for writing such a mindful post. I was totally immersed in the words. I wanted these words to flow continuously forever. We really want such a motivation to be present in our PRESENT. Otherwise our time goes either in our past or future. Thank you so much for your wonderful comment, Gursimrat. 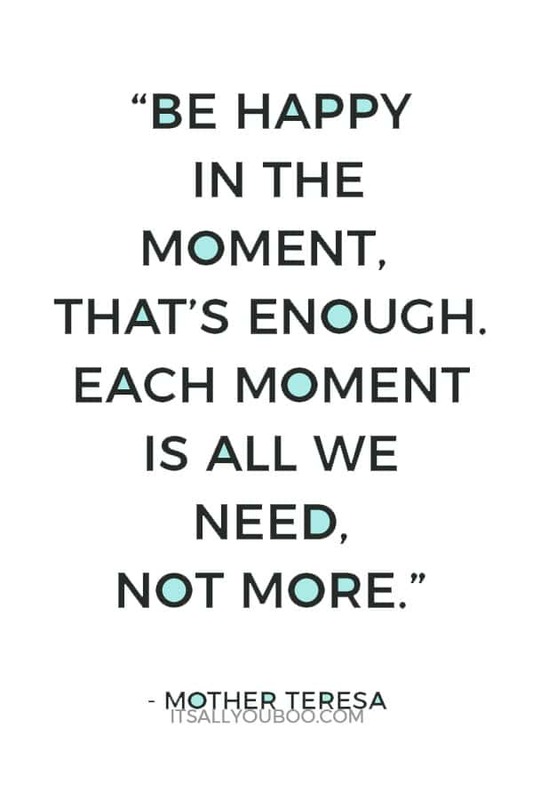 I’m happy you enjoyed the post and you are totally right, if we don’t learn to be in the moment, we spend all our time in the past or future rather than the present. I have to get better about this. It’s my goal to do this every morning when I awake. Hi Sheena, starting even with a short mindfulness practice in the morning is such a great way to begin the day. Maybe a brief meditation for just a few minutes is a good way to start. Then, once you get used to that, you can build on it. I just recently purchased a book on mindfulness that I haven’t read yet. This article has me wanting to go find it because I could use this in my life. Hi Stacie, yes, go find that book 🙂 Mindfulness is such a powerful tool and I’m hoping you’ll be able to start benefiting from it soon! I struggle in this area, it is on my laundry list of things to do better with. I need to focus more on me and make sure I am intentional. Hi Mimi, it’s great that you’re aware of that – that’s the first step 🙂 I know it can be hard to start with ‘yet another thing’ but even five minutes a day are a great place to begin, either as a dedicated practice or if you decide to apply it to a task you’re doing. And once you can make that a habit, you can go from there. I definitely could use some practice with mindfulness! Definitely looking forward to doing the Spring Clean Your Mind! That sounds so good! We live in such a rush rush world we forget to slow down. I want to practice as much mindfulness as I can and do better. This is such a great and informative post! I definitely want to use these tips the next time I try to focus on becoming more mindful. Whew chile… I have had many a day that’s fine by and I’m like what did I even do today? I love the tip about breathing breaks. It’s something so simple but it could definitely help. I totally know what you mean… and those are most often the days when I never took a proper break and feel totally exhausted and blank at the end. So even if I got a lot done, the sense of achievement is smaller cause I don’t remember what all I did… Hope you are able to make time for those little breaks! Maybe deliberately scheduling them would help?